In my post about the Carson Mall the other day, I briefly touched on the subject of the Silver City Mall. I wanted to revisit that mall in its own post, because I have these pictures I’ve been sitting on forever, and now is as good a time as any to bring them out. 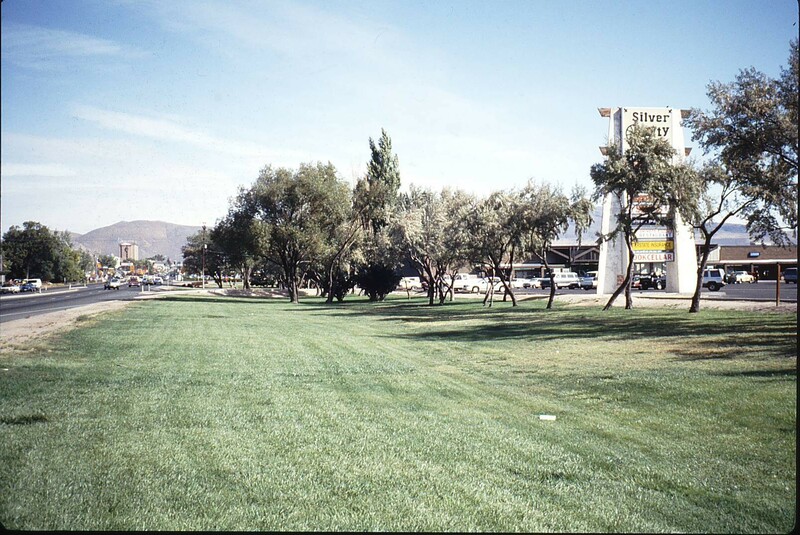 The Silver City Mall was located at the corner of Fairview and Carson. Still is, actually, since there’s still a shopping center there, and according to Google Maps it’s still called the “Silver City Mall”. But as far as I know you won’t find that name anywhere on property; the name has been wiped out. Above you can see the original sign for the mall, half-hidden behind a tree on the right. 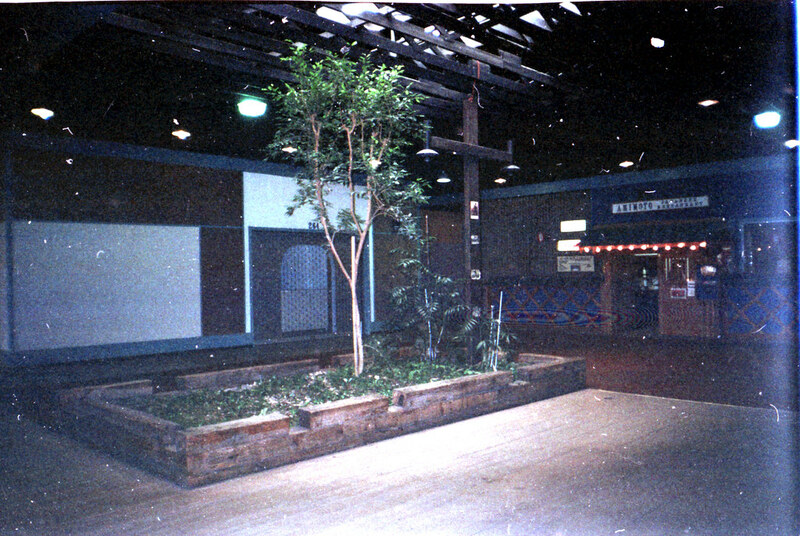 The Silver City Mall was one of only two enclosed malls in Carson City. The other one is the Carson Mall, about a block and a half north. I’m not sure who decided to build the two so close together, but that proximity may have been one of the things that doomed the Silver City Mall. That and the fact that to go inside was like walking into a dungeon. 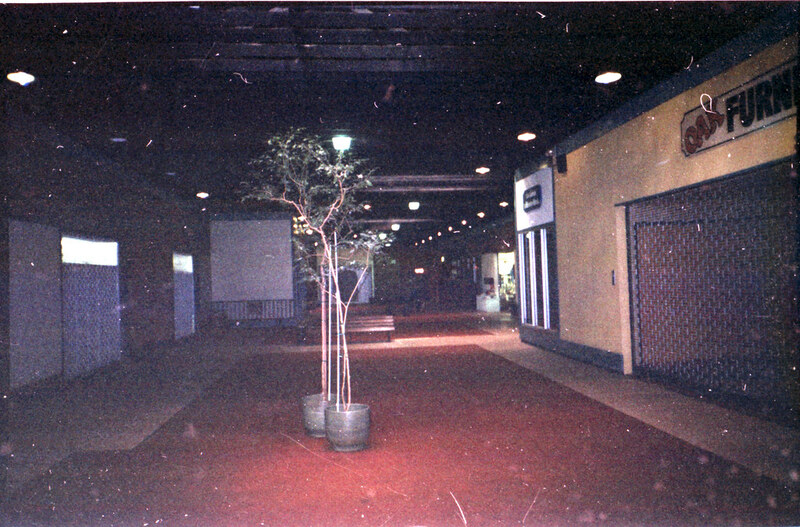 The mall I think was built in the 1970s (if I’m wrong about anything here, please send in comments! ), and the designers made the brilliant decision to use dark wood, paint the ceiling black, limit the number of skylights, and illuminate the place with just a few bare hanging bulbs. I swear, it was one of the few places in town that even at night was darker inside than out. 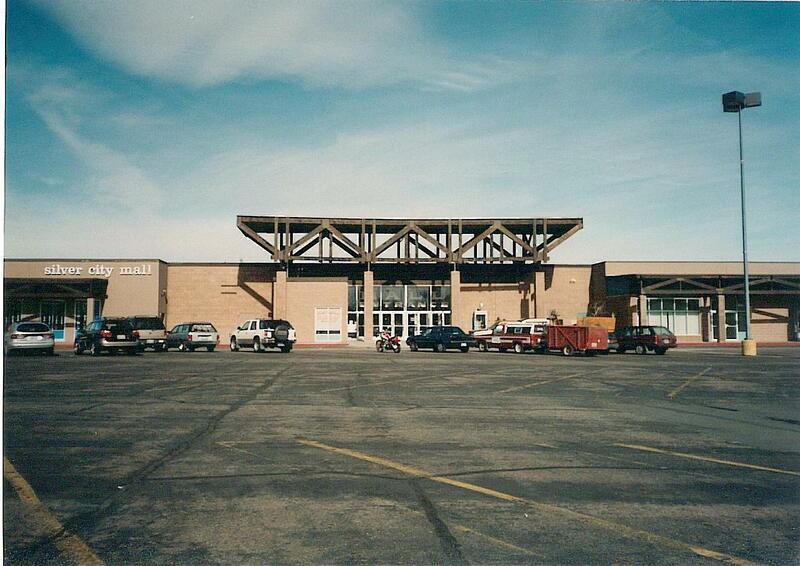 The mall was home to Albertson’s, Osco Drug, Sears and Kmart, as well as a few stores in the enclosed portion. A gym, the Bookcellar bookstore, a laundromat, Amimoto Japanese restaurant, a hair salon, a candy shop, and a slot parlor are what I can remember. There were some other storefronts, some of which sat empty for the entire 15 years I knew the mall, others that opened and closed with little stores of no note. Kmart closed in 1994 to move to the new SuperK at the north end of town. That store closed in 2003. Albertson’s moved out in the mid 90s, and Office Depot moved in. Osco changed its name to SavOn. Ernst Hardware moved in to Kmart’s space, but closed in 1996. The mall was in bad shape. 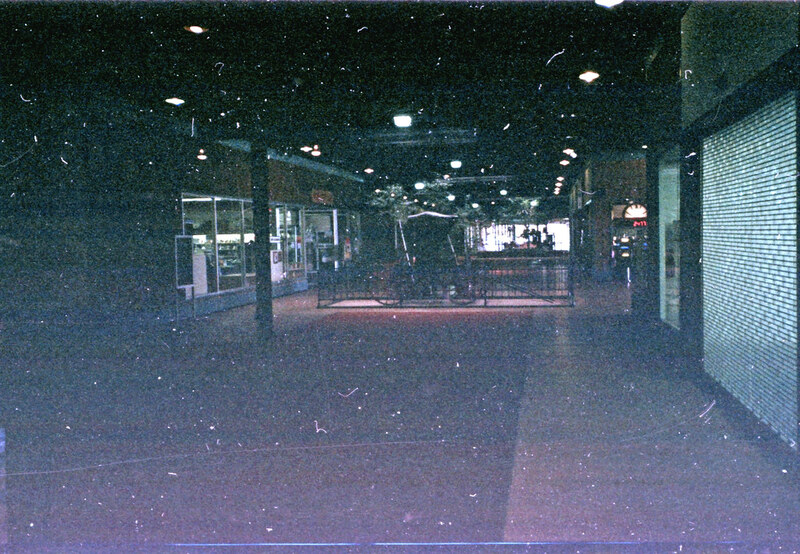 And that’s the condition the mall was in in early 2000, when it was announced that it was going to be torn down to make way for a Lowe’s Home Improvement Warehouse. 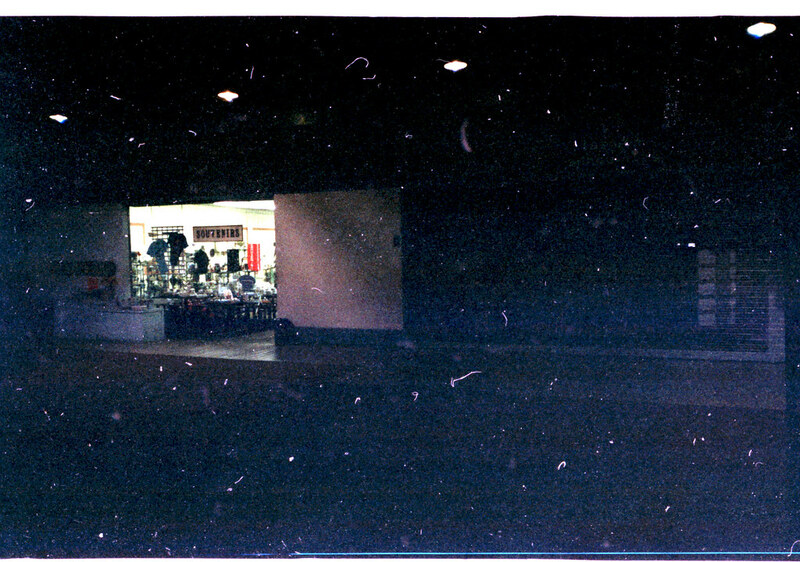 So in February of 2000, even though this was long before the days of digital photography, I decided to use half a roll of precious film documenting the state of the Silver City Mall, knowing that soon it would all be gone. I think that was the first time I photographed something explicitly for the purpose of preserving it, something that I now do on a regular basis on this site. So I guess you have to blame the Silver City Mall for all the nonsense that goes on around here. Anyway, on to the photos. Any of you that have been around for more than 10 years, feel free to play along at home. This view across the parking lot looks at the part of the mall that was torn down. On the right is the Ernst storefront, but Ernst had been closed for nearly four years. The main entrance to the mall. I’m not sure if the truss is supposed to remind you of a railroad bridge, or just the general inscrutability of 1970s architecture. This corner of the mall usually was full of swirling trash, caught in some kind of perpetual vortex. Inside the mall. 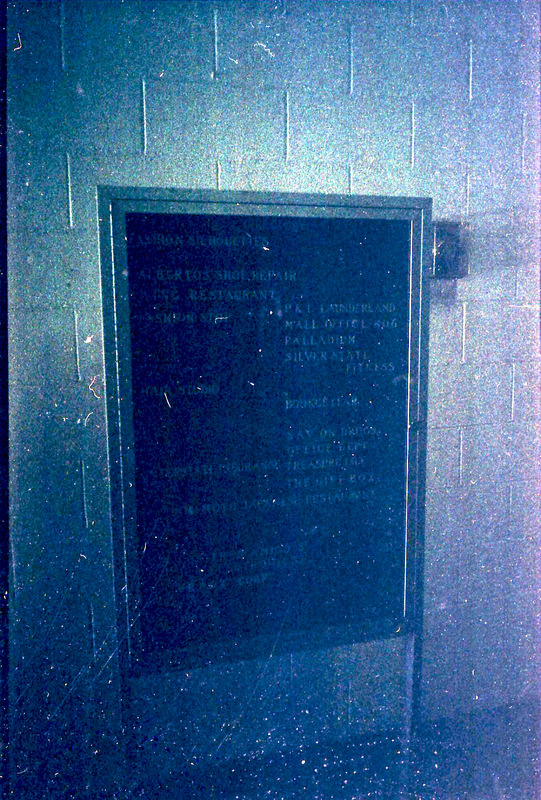 These photos had to be lightened quite a bit from some dark negatives, so the dust and scratches are very visible. This was one of the bright spots in the mall, underneath one of the few skylights. Amimoto Japanese Restaurant was on the right. A view down the mall’s main hall. Yes, it was really that dark all the time. In the center was an old buggy on display. To the left was the Bookcellar bookstore, to the right you can see a couple of slot machines. This was the only mall where you could get mugged and nobody would know. Only one store is open, but it’s not very inviting. Another look at the main hall. Closed stores to the left and right. A couple of lonely trees huddle together to fend off the darkness. This photo really had to be lightened a lot in Photoshop. It’s the mall’s directory, hidden away in one of the dark corners. In the back of the mall was the Taqueria Los Tres Amigos, and another entrance to the mall itself. I also managed to track down a few old articles in the Nevada Appeal about the mall’s demolition. For the second time, rumors have surfaced that Lowe’s has made a deal with Tsutomu Wakimoto to either buy or lease the Silver City Mall at the south end of the Capital as a site for the new store. Wakimoto could not be reached for comment, but a corporate representative at Lowe’s headquarters in North Carolina said no final agreement has been reached. The community development department received special use permit and major project review applications Thursday from Lowe’s for a store at Fairview Drive and Roop Street, former site of Ernst Hardware and, before that, Kmart. As Home Depot puts the final touches on its new Carson Valley store, Lowe’s Home Improvement Hardware is putting the final touches on plans for a store in Carson City. On Wednesday, the Carson City Planning Commission unanimously approved a special use permit for a Lowe’s store, planned to replace the former Kmart/Ernst Hardware building at Fairview Drive and Roop Street. It has been three months since Silver State Fitness moved into its new location and things are beginning to settle down. The gym and associated Superior Physical Therapy moved to 1945 Idaho St. from its prior location in the Silver City Mall. Escrow closed Monday on parcels at Silver City Mall, clearing the way to for Lowe’s Home Improvement Warehouse to build a proposed 135,000 square foot hardware store. Escrow documents filed Monday show the sale of 11.2 acres of land owned by Tom and Margarita Wakimoto for $4.77 million. Wakimoto has declined to to comment publicly on the sale, but he has told tenants notification of lease terminations wouldn’t be made until escrow closed. The planned Lowe’s Home Improvement Warehouse Store could be opened on Fairview Drive by early next summer, a company spokeswoman said Wednesday. Meanwhile, tenants of the east portion of Silver State Mall that will be razed to make way for the store have begun to receive eviction notices and make plans to relocate. Lowe’s spokeswoman Suzanne McCoy said current tenants have been given 30 to 60 days to vacate the property. Demolition of half of the Silver State Mall to make room for a Lowe’s Home Improvement Warehouse will begin this week, possibly as early as today, according to a company spokesman. Jack Mandel, a real estate specialist for Lowe’s, said demolition would likely begin at the southeast end of the mall, the end farthest from Sav-On Drugs and Office Depot, which will remain in their present locations. Chain link fencing has been installed around the eastern portion of the parking lot on Fairview Drive between Carson and Roop streets. The businesses that used to occupy the mall portion of the complex have closed their doors or relocated. A new Sav-On Drug store could open by next summer in the Silver City Mall on the site of the former Ming’s Restaurant. The former restaurant will be demolished so construction of a 15,251-square-foot store could start in December, Sav-On spokeswoman Judy Decker said Tuesday. Lowe’s Home Improvement Warehouse is set for a mid-June opening, and a new Sav-On is expected to be ready by late summer in the Silver City Mall remodeling project. Mall developer Fadco is still looking to fill the space that will be left vacant when Sav-On moves across the parking lot to its new building at Carson Street and Fairview Drive, said developer Don Gaube. Gaube said his company has been in talks with several retailers including Best Buy, a chain home electronics retailer. Nobody has committed to the space. And also an additional story about “Big Al’s Good Time Pizza”, which opened in the restaurant space in the mall’s parking lot on July 28, 1999. Big Al’s didn’t last long. That restaurant has been Q’s BBQ for many years now. When I moved to Carson in the summer of 1975, that corner was a dirt lot and the mall sprung up within a year ofter that. Many stores that passed through including a locksmith; it’s where I took the keys to my grandparent’s car to get copied the first time I was allowed to drive alone (evil grin). How could you write all that about this place and not even mention Choplifter? And Battlezone, Elevator Action, Gun.Smoke, Track & Field, and uh, one or two other games that weren’t even worth remembering, let alone playing. Also, I think there was Gertie’s Goodies donut shop, and I think there was a baseball card shop stuck in a closet that lasted for a while. Gerties Goodies is what gave the mall a dinstive smell!! I worked there for a while at Weeds, Wax & Things! I also remember a slipper or alpaca store that sold those furry natural slippers in the mall, and the thai place on the back was an italian restaurant for a short while, the owner was from the bay area i think, i just remember having spaghetti and meatballs there across from where mr gasket was……I remember getting slippers for a gramma there a few times! great memory thanks for reminding us of the old dark mall! When I was a kid, the “swirling trash” corner had an arcade and a laser tag place. I don’t remember what it was called, but it would have been in the early 90s. My husband loved the apple fritters from the donut shop. Anyone remember the roadside reststop northwest of the mall? I delivered the mail to the Silver City Mall in 1985-86. The mall was fairly dead back then, and just as dark and dreary as you described. Kennedy’s Books was in the Mall back then. Bookcellar took it’s place when Kennedy’s moved up on North Carson. There was a fireplace store and a gift shop. I think it was called Treasure Chest. Skagg’s was the drug store there until Osco took over that chain. Rico’s Pizza was where the BBQ place is now. Before Ming’s Restaurant there was a restaurant called Hobo Joe’s. They were a chain. I remember another one in Bishop, Ca. I remember a deli at the rear of the mall facing Mallory (or Richdel). I also remember wooden plank floors on the inside. Hated going there but I loved the bookstore. Man, I’m a big dude and even I would feel creeped out shopping there. In the northwest corner, near the drugstore, was a store called Gepetto’s that had a black light room filled with posters; I loved going in there because my clothes would “glow” in the light. At one time an herb shop was also located a couple doors down from the donut shop. I also recall seeing Charlie Daniels shopping in the Albertson’s that was located where Office Depot is now, probably in the summer of 1981. I have a lot of fond memories of that shopping center because my grandparents’ house was just a few blocks to the south and I spent a lot of time hanging out in the mall. I rented my first chair at a salon in the corner of the mall. It was 1990, the beginning of a wonderful career and life. Don’t forget Jimmy’s Sk8 Shop which later became 702. James Koyama operated there from 89 to 93 I believe. 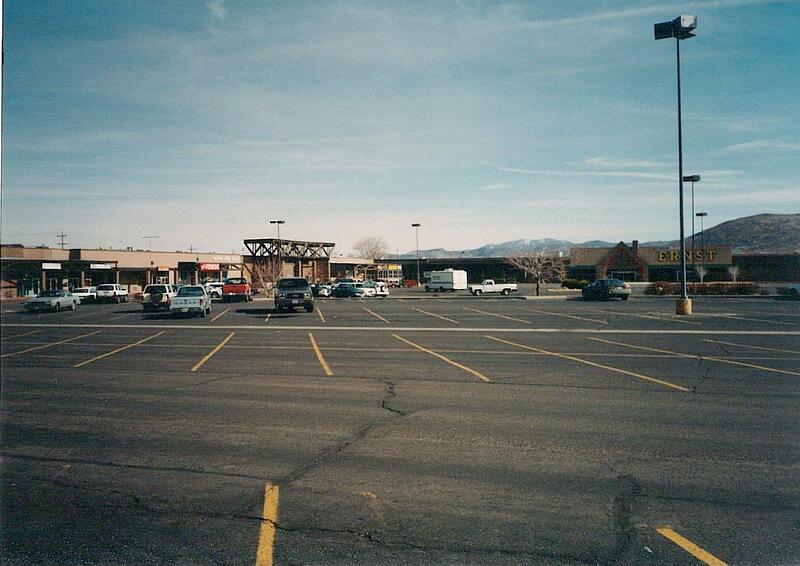 I remember the Hobo Joe’s on the southwest corner when I’d visit Carson City in the mid-1970’s. When I moved to Carson City in 1986, The Miramar House, a Chinese Restaurant had taken it’s place. That was probably 10 years or so before Ming’s took over the building. This is AWESOME!! Thank you so much for sharing! My husband will be stoked to see these pictures and read this too. We’ve both been here since the 80’s and were just talking about this old mall and trying to rememeber what was in it and how it looked. This is great!! The Silver City Jewelry Store was there for 8 years. We pierced many many ears. Radio shack, Kinney Shoes, The Pear Tree, Camera Store, Mode O Day, Joanne Fabric. There were some great places there in the beginning. Isco was originally called Skaggs. You could walk between there and Albertsons inside I think. There was also a good doughnut shop. What about the Christmas displays they would put up every year? The animatronics of the day. I always wanted to see them as a kid. I’ll never forget that old wooden smell as you walked in. We went there every year to visit Santa. I also remember getting icee’s at Kmart when I was a little girl. Ed’s card shop! The only place in town to get your comic books back in the day! 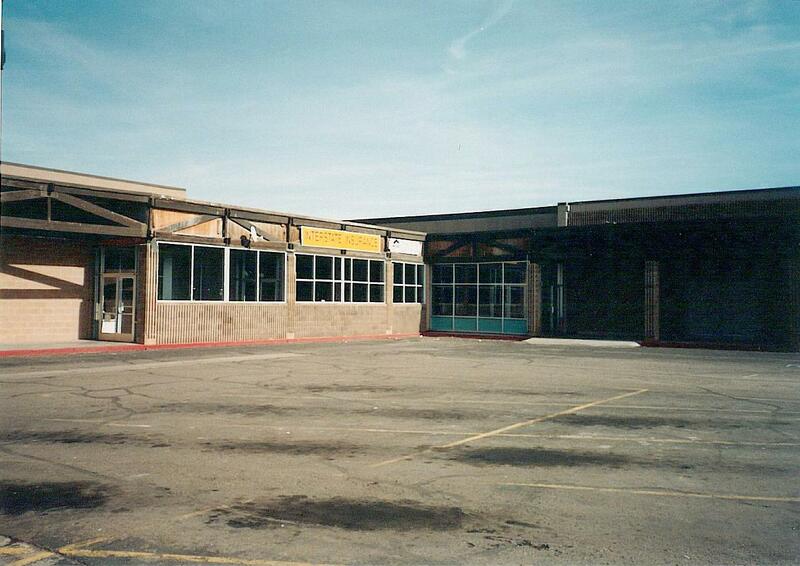 I also remember the arcade/restaurant/dance hall that was in the garbage corner. They promised a laser tag and go carts but it never happend. After that place shut it’s doors it was not long after that the mall was destroyed. In 1991 I worked at Dagwoods that was in the left corner from the back parking lot. Best burgers ever! As a kid my parents would always take me to see the Christmas displays and Santa there too. My mother worked at Sears for years. The good ol’ days! Los Tres Amijos had the best tacos and menudo in town. In the 80’s and 90’s my brother, our friends and I would frequent the mall nearly everyday. Ed’s baseball card shop was our hangout. My grandma worked as the slot and laundry attendant for awhile. We’d ride our bikes/ skateboards/ rollerblades through the mall making so much noise on the uneven and loud wooden floors. Oh, Rico’s was the spot as well! Great memories, I miss Carson. I know Gertie’s Goodies because I won a radio trivia question. Prize was a dozen donuts which fed the office in the Nye Bldg (also now gone). The question: what big band singer had a hit with I’ve got a lovely bunch of coconuts.